I've owned this model for about two years now. 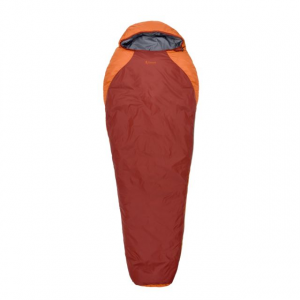 It is a fabulous sleeping bag. We went camping last minute in late autumn in Northern Maine and ended up in a rain storm. When we woke up, we found ourselves in two inch standing water inside our tent. But thanks to NEBO, we awoke cozy, warm, and dry, while the rest of our tent and hiking gear was soaked. I hike with this in my pack all the time. It has 4lbs of fill weight that even I can take anywhere. I am 5'6, 120lbs. 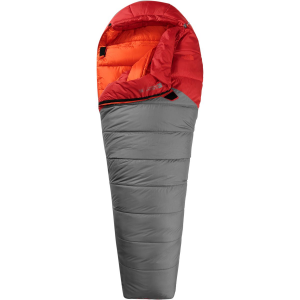 It can zip to my boyfriend's sleeping bag in seconds and is the most rugged sleeping bag I've ever owned. Is the definition of waterproof!!! 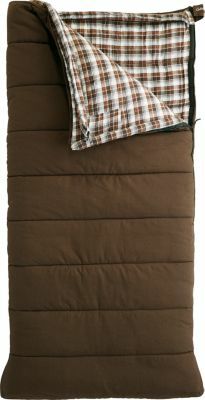 I would and do take this sleeping bag for everything. Just really not recommended for summer travel as you will DIE of overheating in this bag. It is no joke!!! I am a big man, 6'2", 255lbs. Since our Boy Scout Troop is cold weather enthusiasts, a lot of our camping is done in the wintertime, so I needed a big bag. Very comfortable, NO problems staying warm. Too big and heavy for backpacking, but perfect for hauling in on a sled. I can sleep in my skivvies, without a worry. Only issue is that the zipper may tend to snag, if you yank it up or down too hard. I would recommend the model with the flannel liner though, for a little extra comfort. Do not use this bag when it's any warmer than freezing, or you'll sweat to death. For the price and what I use it for, I would recommend it to anyone looking for a good value. The Nebo Sports Blue Moose -10 is not available from the stores we monitor.